Comic book fans are always happy when Stan Lee and the rest of the Marvel team decided to make a movie about their favorite comic book hero. There were hits that truly gave justice to the comic book hero they loved and there where misses that fans tried to forget. Now that the "God of Thunder" has his own movie, did Marvel gave justice to this hammer wielding hero or should they have a "reboot" just like what happened to the Incredible Hulk? Find out after the jump. The elements in making a movie a hit are eye candy, reasonable plot, good acting and good musical score. Thor fortunately are good on all of the above mentioned. If we talk about eye candy, women will tell you that it's all about the nice body of Chris Hemsworth and the men will tell you it's all about Natalie Portman and Jaimie Alexander. Geeks will tell you it's the awesome design of Asgard and the special effects that look marvelous in eye popping 3D. The shiny effect on armor and other glittering objects were really done well and watching this movie entirely on 3D is definitely a must. 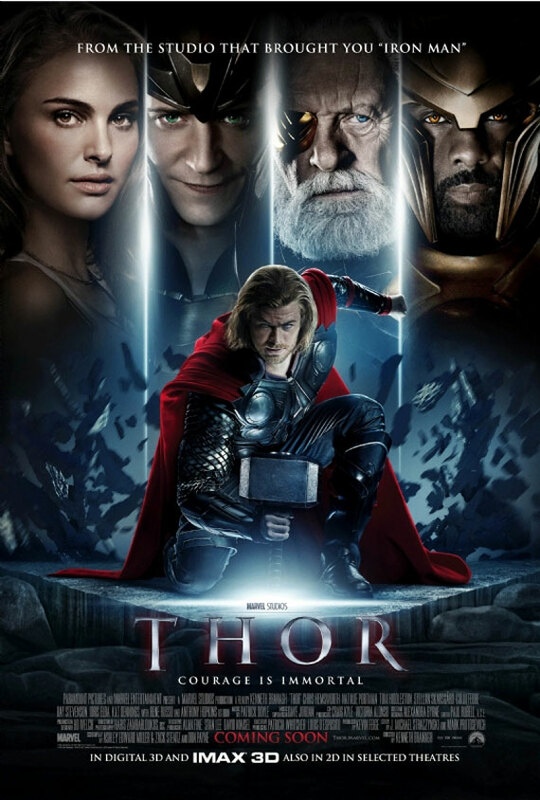 Unlike previous movies claiming to be 3D, but just had 3-5 minutes of actual 3D, Thor will treat you full 3D through-out the duration of the film. Regarding the plot, It was nice that Marvel considered the audience that had no idea what's Asgard and the whole Thor universe. The almost 1 hour of prologue is enough to answer questions that may rise during the progression of the story. The only flaw I saw (which is only minor) is that there's not enough character development on minor roles, like Thor's friends and several other characters. Also, the origin of Thor's power was not based on the comic books but an entirely new one (typical to most movie adaptations)but these small cracks did not affect the awesomeness of the movie. The acting of Chris Hemsworth and Natalie Portman on-screen is noteworthy. The added romance to the plot increases the likelihood of having a ThorxJane fans club and attract the younger audience. Other characters performed their part well, which is good, since like I said previously, that not all characters where fully developed. The enchanting musical score was given justice by the DTS of the theater house I had watched Thor and it really captivated the mood of the scene. Some may overlook this small detail but the music has a major impact when combined with the rich visuals of the film. Overall, this movie is a bang for the buck. Watching it on 3D will never get you wrong. Also, I wouldn't mind if a sequel may come out in the future. By the way, wait till the credit roll end, as with the previous Marvel films, a nice epilogue will appear. Awesome review master. You pretty much covered all bases here, and I think you're review is more read-worthy than mine. Though I'd disagree with the 3D thing. Barely noticed any difference from previous 3D hits. Of course, I watched it in digital 3D. Mayaman ka kasi kaya baka naka-iMax ka.